Discussion in 'Classic Manual Cameras' started by peter_naylor|1, Jun 4, 2009. Folks - some help needed here from you Kodakians out there, please! I've acquired a Rochester-made Kodak Series 111 VPK with F6.3 KA Anastigmat and Diomatic No '0' shutter, which proved easy to date to 1926 - 30 thanks to my Coe's 'Kodak' bible. However, this lovely old compact folder also came with an interesting bit of Kodak history, in the form of a 16-page sales brochure titled 'Wherever You Go Take A Kodak With You'. This Oz-printed Kodak brochure is unfortunately undated but clearly of far earlier heritage than the VPK 111, because one of the ads in it is for the original strut-type VPK 'Soldier's Camera'. In fact, there are several references to 'soldiers' throughout, which tend to suggest it was printed during WW1. However, one maybe positive dating clue is an advert for the pneumatically-operated 'Kodak Self Timer', because it has the preamble that it's a new item. I've done some Googling but haven't been able to come up with anything specific, other than one mention of an example for sale being made in 1918 which goes along with my WW1 theory. So, can anybody come up with anything to confirm this, or maybe even suggest an earlier date bearing in mind we here in Oz tended to get stuff from America or Europe a year later thanks to the 'Tyranny Of Distance'? 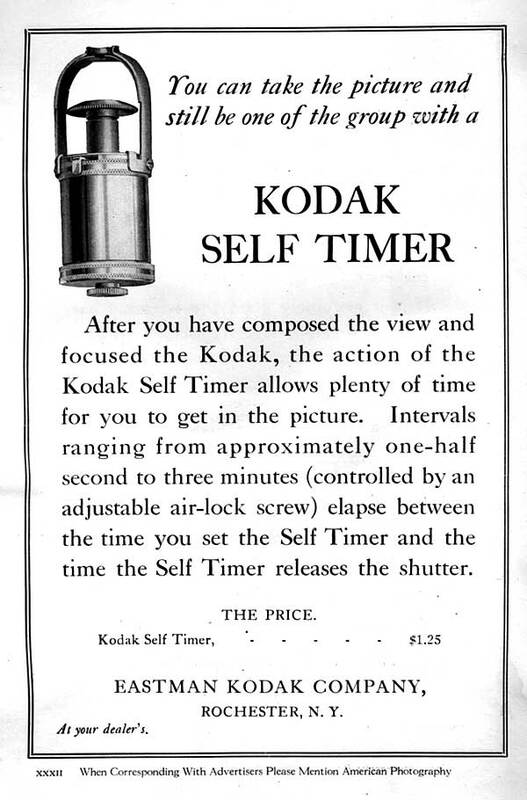 I've attached a scan of the advert to assist in identification, because apparently there was a later mechanically-operated Kodak Self-Timer. There was a similar self timer called an Autopoze, and was advertised in 1901 that was for use with the pneumatic shutters and hooked up to the rubber tubing. It was advertised as an "automatic button pusher". I believe the cable release was invented about 1907 or so and the self timers for them probably followed shortly after, so WW! would certainly be in the time frame. 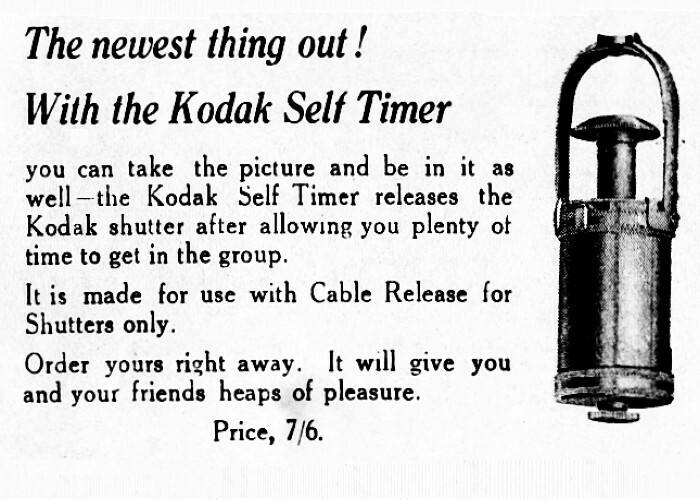 The Kodak self timer is shown in the 1920 catalog as selling for $1.25. It doesn't mention here that it is a NEW item, so probably was around for a while before that.. I was probably made and in use well before this time in Germany or England, and then Kodak bought up the rights and slapped their name on them. Here is an ad for the timer from the March 1918 issue of American Photography. I could not find any mention in the 1916-17 issues. there is a picture of the self timer on my website http://kodak.3106.net/index.php?p=711. Unfortunately also undated. But it seems you are correct assuming this to be an item sold during WWI. I'll check my old German catalogues this weekend to see if there is an original German version. Cliff, Marc and Mischa - many thanks for your various inputs here. So from what you've supplied, 1917-18 appears to be the likely date of printing. A Canadian friend asked me for a scan of the full-page advert in the brochure for the strut-type Kodak VPK, because he's something of a collector of these and thought he might be able come up with a date from the price and lens spec details. So I did, and he's come back with 1916 -17. Allowing for the 'Tyranny Of Distance' aspect, I'm thinking 1918 is the most likely date because things took a long time to reach us here in Australia back then. Mischa - are you still taking additional stuff for your Classic Kodak website? I can scan the entire 16-page brochure, if you like. It's a bit faded and has suffered some insect damage especially on the front and back pages, but everything is readable. The various references in it to 'soldiers camera' and 'sending soldiers snaps' are a bit tragic with hindsight, but we can't change history - WW1 happened, and there were 12 million graves as a result (sigh). absolutely, I'm still trying to update my Kodak site and have collected a number of good pictures already but haven't had time, mostly because of all the work on my non-Kodak camera collection site.